Chimney Tops, a well-known Great Smoky Mountains National Park landmark. 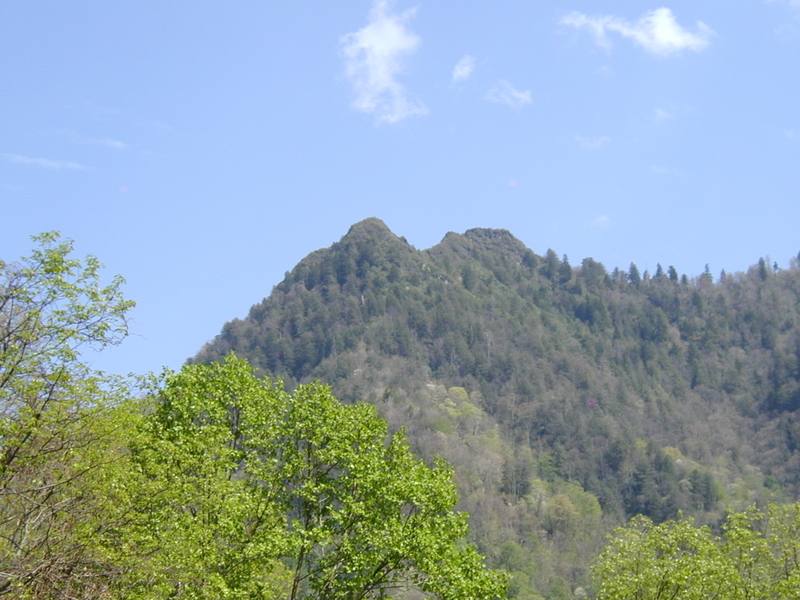 The right hand peak has a deep cavity in the top, thus the name "chimney". 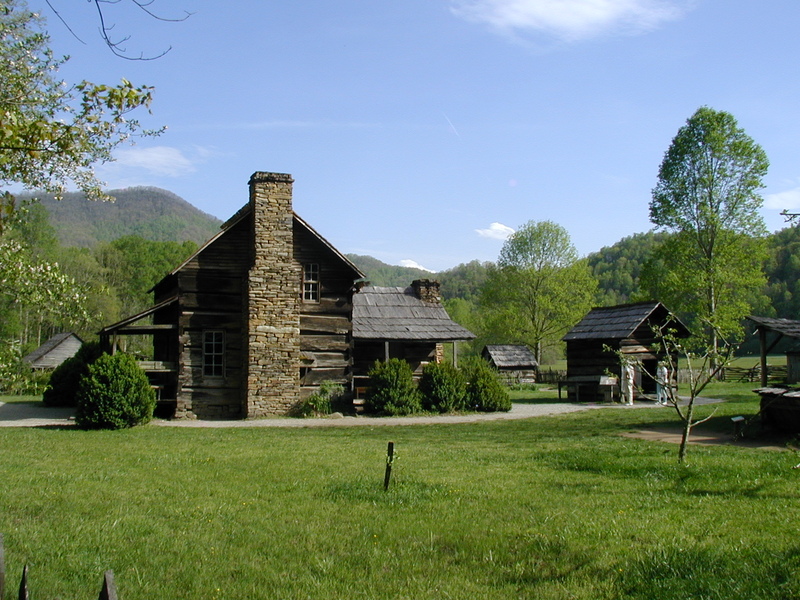 This is the main scenic highway (hwy 441) that bisects the park, running from Gatlinburg, Tennessee, to Cherokee, North Carolina. 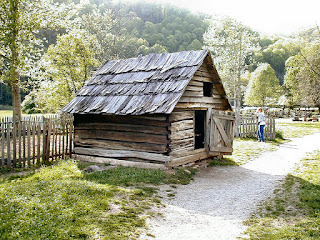 It follows the Little Pigeon River on the Tennessee side, passes over the mountains at Newfound Gap, and follows the Oconaluftee River on the North Carolina side of the mountains. 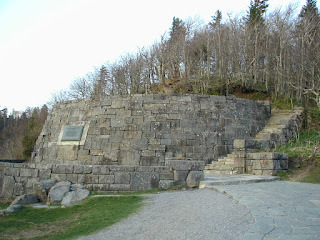 This monument stands at the summit of Newfound Gap. 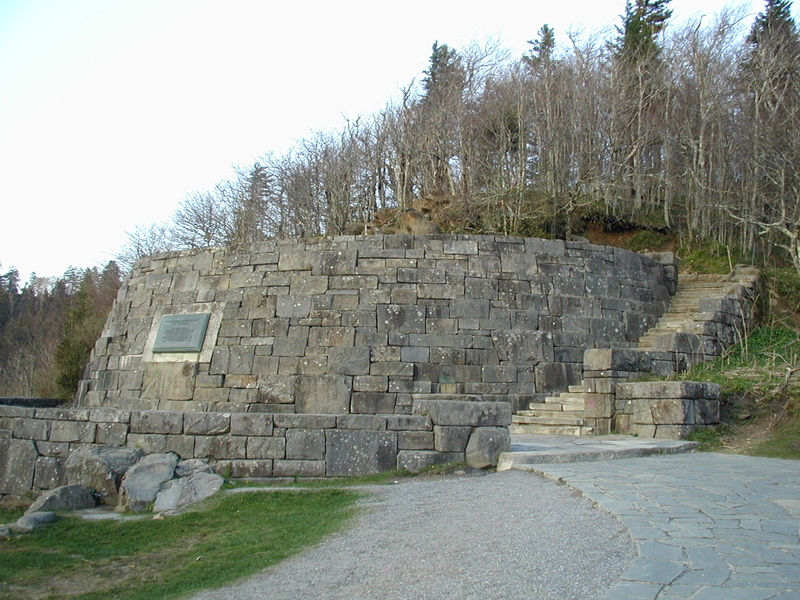 The Appalachian Trail passes just to the side of this monument. 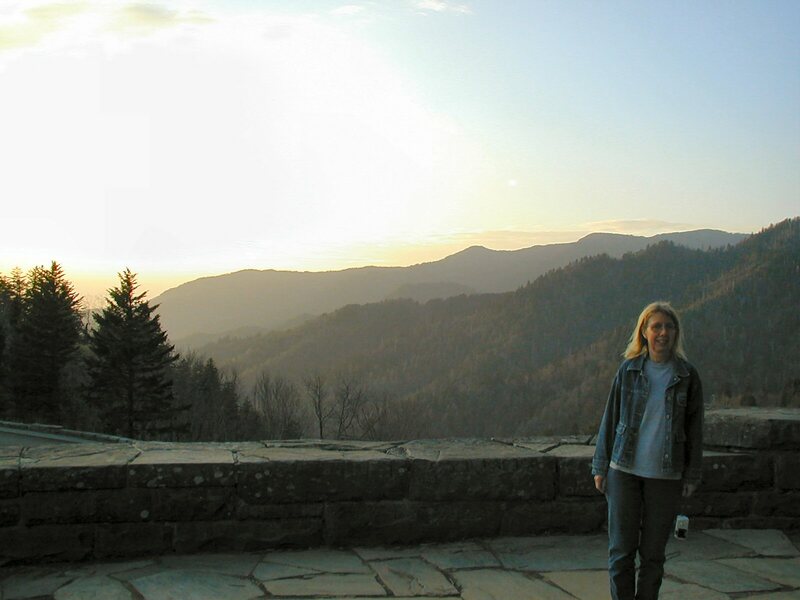 Julie with the Smoky Mountains behind her. The photo was taken from the top level of the monument pictured above. Julie at the trail marker for the Appalachian Trail. 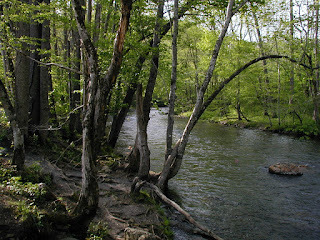 The Appalachian Trail is a hiking trail that extends all the way from Maine to Georgia. We hiked about 1/8 mile on it. 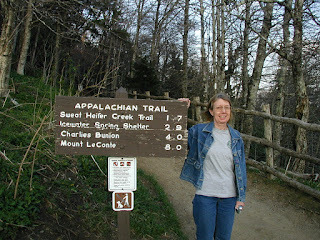 It was not one of our more ambitious hikes! The Park Service relocated a number of historic buildings from throughout the park to the Mountain Farm Museum on the North Carolina side. The result is a "super farm" -- it has more buildings and features than any one farm of the late 1800's early 1900's would have had. However it gives the visitor the opportunity to see a lot of different types of buildings and farm features in a single area. 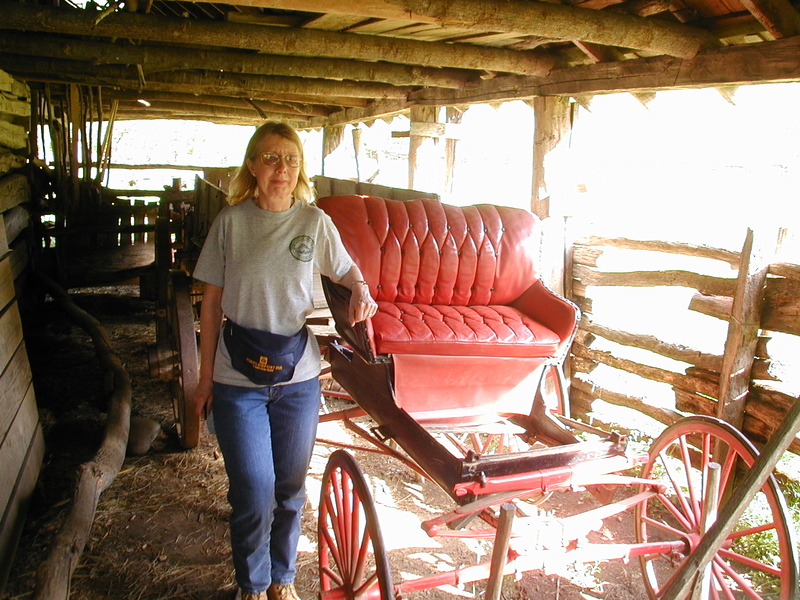 This is a "living museum", meaning that the Park Service operates the area somewhat as it would have been in the late 1900's, with some livestock and garden crops being grown at this location. None of these buildings in it's original location, although the barn is pretty close- it was moved only a few hundred feet from it's original location. Unfortunately we arrived late in the day, after they had closed up the buildings. The Davis farmhouse, unique as it is constructed of Chestnut wood. By the 1940's Chestnut Blight killed most of the American Chestnut trees, so no more Chestnut wood homes were built. 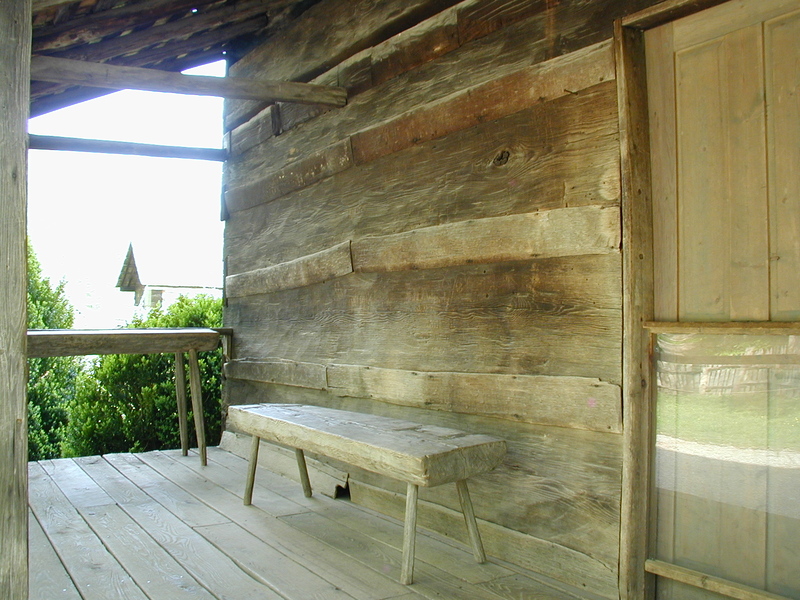 Note the dove-tailed joints on the log walls of the Davis farmhouse. Dove-tailed joints are difficult to make, but hold the logs more firmly together than standard notched joints. The back of the Davis farmhouse. The workmanship on this house is fantastic. 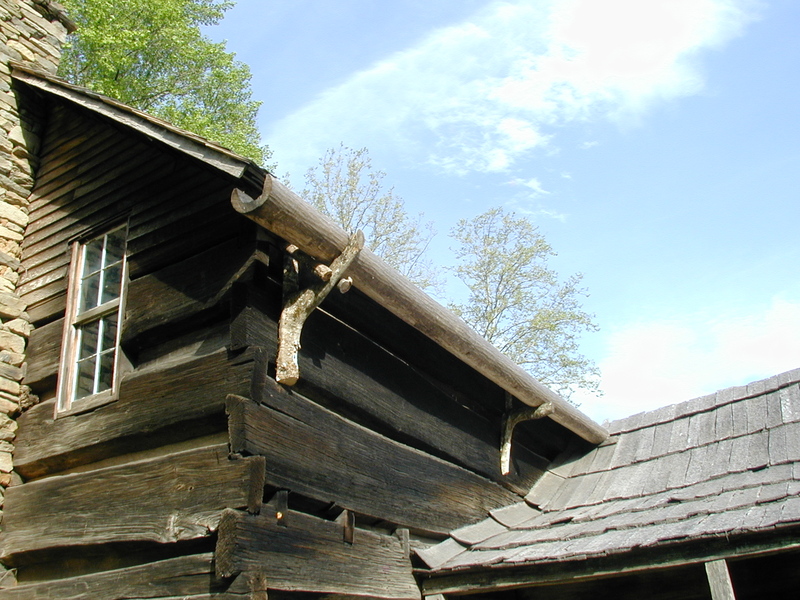 Note the batten boards that cover the gaps between the Chestnut logs on the side of the farmhouse. Often mud was used to seal the gaps, but this house used wood battens. 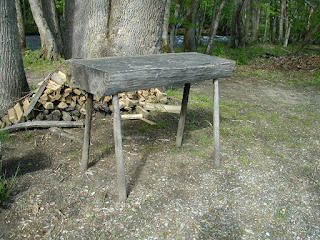 Also take a look at the simple peg-in-hole leg design on the wood-slab bench and table. The odd reflection on the house door is from a plastic barrier that keeps people out when the door is open. Check out the fabulous rain gutter design on the Davis farmhouse. Also look for the floor joists of the second floor protruding through the outside wall. 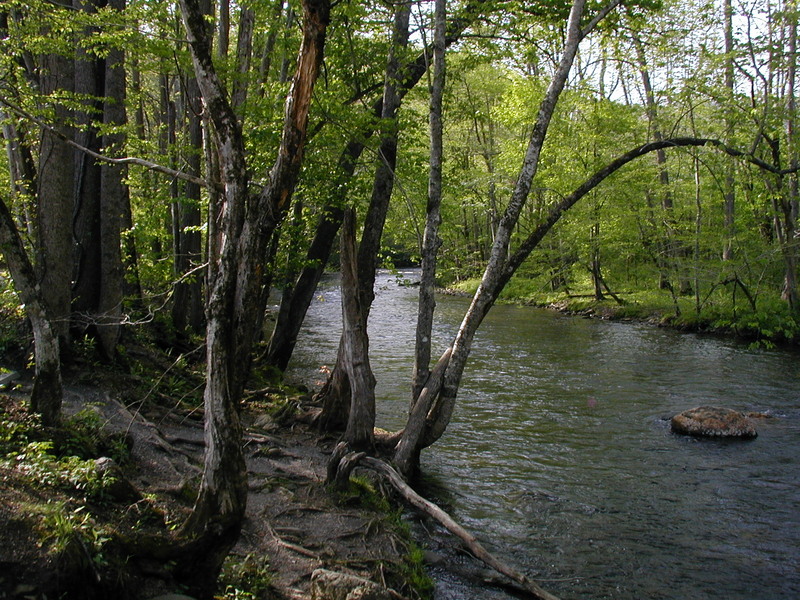 The Oconaluftee River flows by the Mountain Farm Museum. 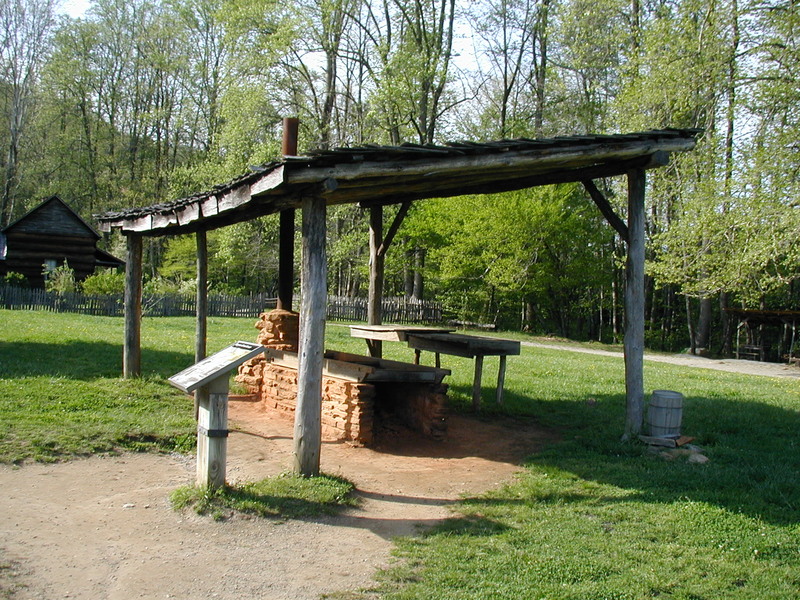 The reading room and corn-cob disposal pit. Located conveniently near to the house, but not to close! There are many styles of barns found throughout the park. This one has a central enclosed area surrounded by a wide, covered porch area that could be used for storage, animal pens, or a covered work area. 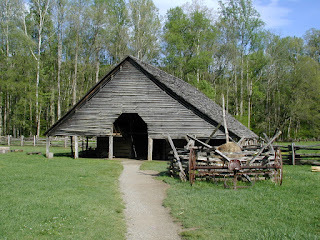 This particular barn served as a "Drover Barn". Drovers were the people who moved cattle and sheep from one place to another. A Drover's barn is basically a motel for animals, where the drovers could hold the animals for the night, before moving on the next morning. In this case the animals were being herded to market over the Great Smokey Mountains. most of the early settlers used sleds that were dragged over the ground. Wheels were difficult to make. Horses were the primary beast of burden used in the area, a few families had mules and/or oxen. The meathouse or smokehouse. Meat was smoked in the smokehouse to preserve it. 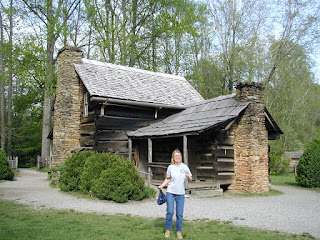 Typically this was the closest building to the house, to help protect the meat supply from wild animals. 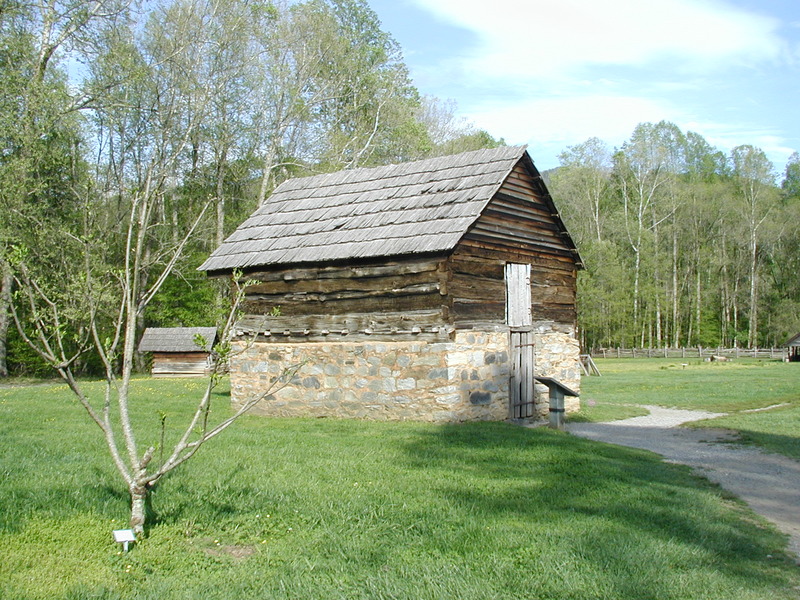 The springhouse was the "refrigerator" for the farm. 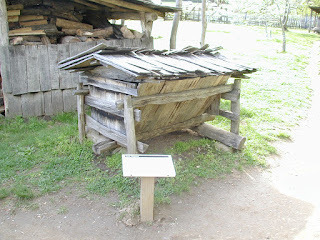 Perishable foods such as milk and butter were stored here. Cool water from a spring or creek was redirected to flow through a wood or rock channel that ran inside the springhouse. 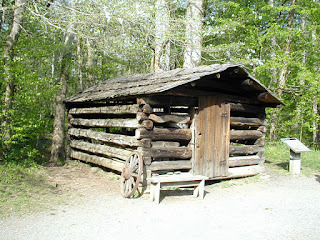 The thick log walls insulated the room and the cool water kept it cool. This is an apple house, for storing apples. This one has rock walls to help keep it cool in the summer. Most apple houses were sunken into the ground like a cellar. Apples were the primary fruit and were used for making cider and pies as well as just eaten. In a cool location like this apple house apples store well for a few months. 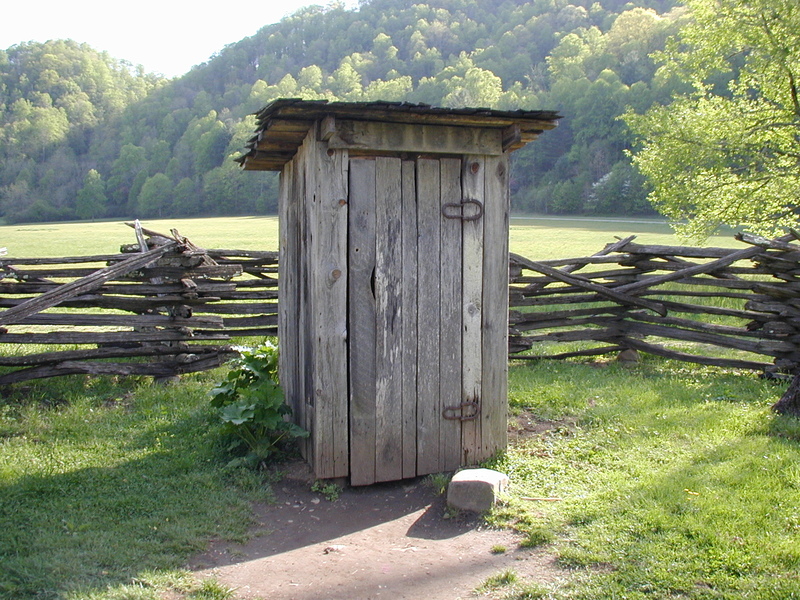 For longer storage they were dried and preserved using sulfur smoke. 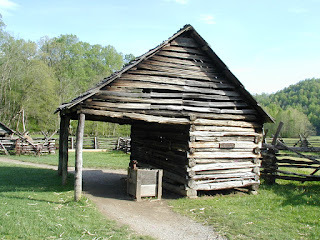 A blacksmith shop. 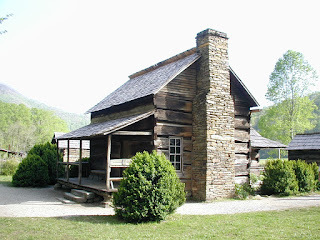 Note the open gaps between the logs in the walls to allow air movement. 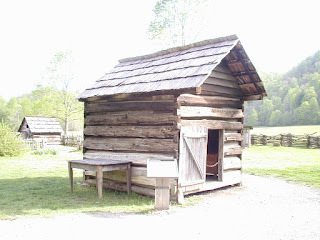 The corn crib was used to store dried corn. 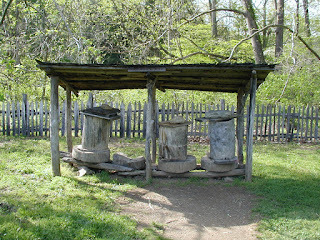 Corn was used for feed and ground into corn flour for baking. This crib has a covered equipment storage "porch". The roof of many smaller corn cribs could be removed to make loading corn into it easier. 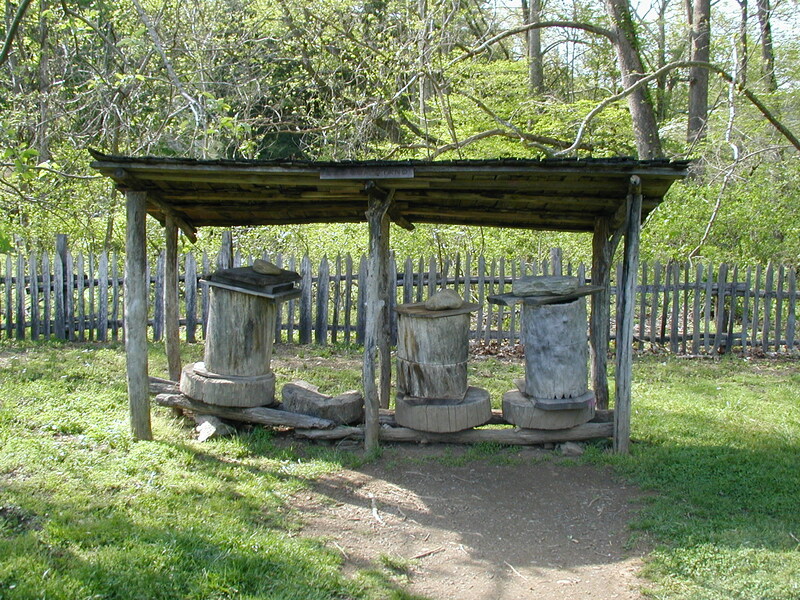 These are bee hives, or "bee gums". They are made from sections of hollow Black Gum tree trunk. it's clear the early settlers had a sweet tooth! ash was also used in the vegetable garden as an insecticide and fertilizer. 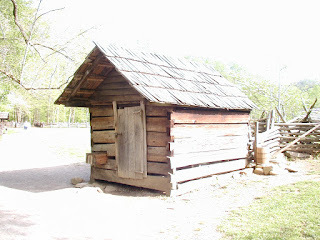 The chicken house. 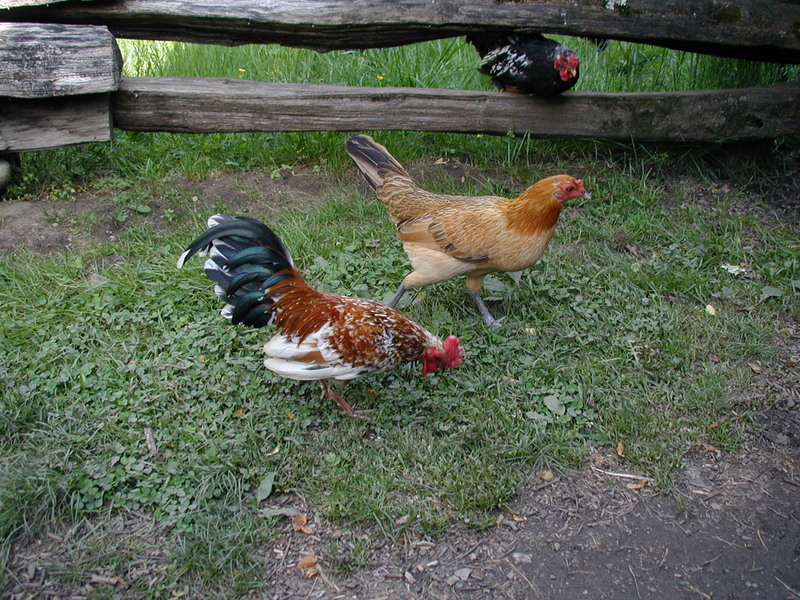 Chickens were supplemented with wild game, including geese, ducks and turkeys. The fowl provided eggs and meat, as well as feathers for stuffing pillows and mattresses. 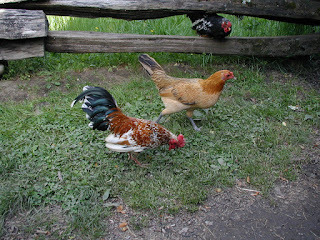 Some of the chicken house residents. 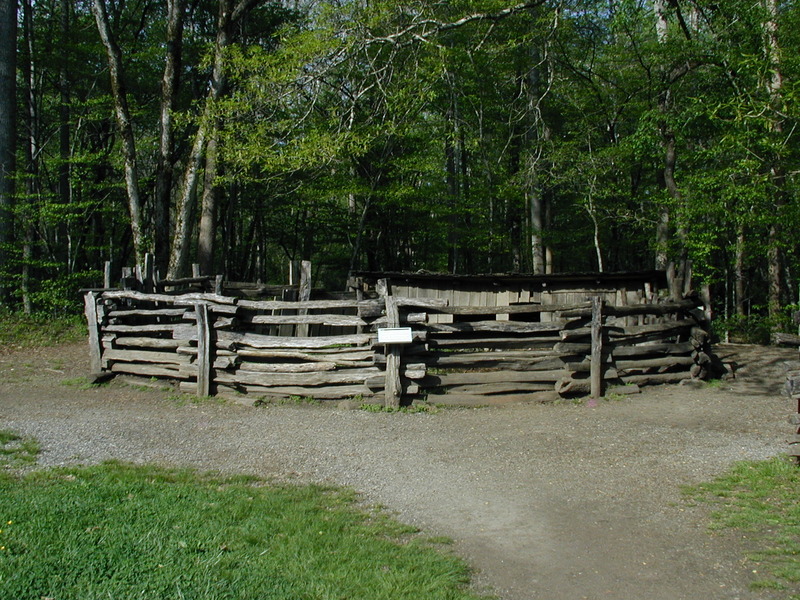 A split rail hog pen. 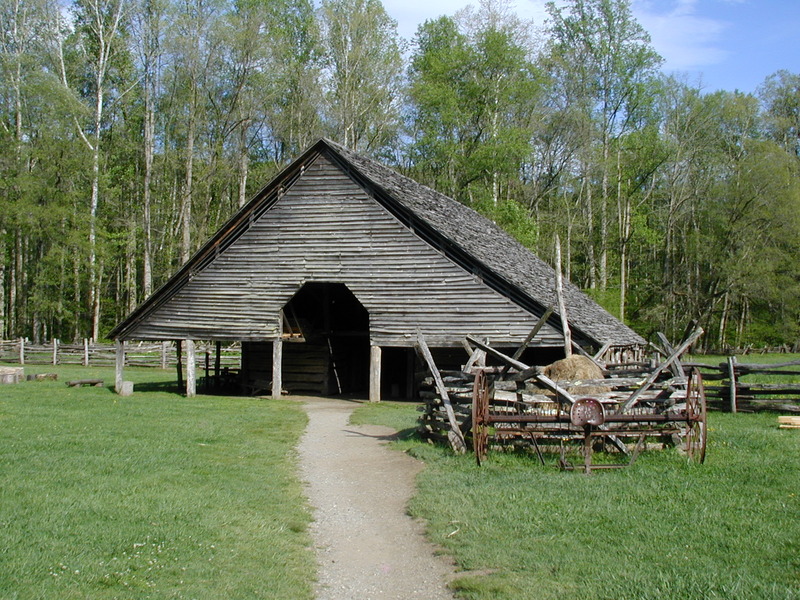 Cattle and sheep were also raised by the early settlers, however hogs were the primary meat source due to the ease of raising them. Most were allowed to run wild and forage for themselves. 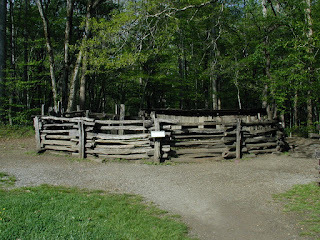 For this reason fences were used more often to keep animals out of the garden than to pen them in. to reduce the water content and make "Sweet Sorghum" (sorghum molasses). 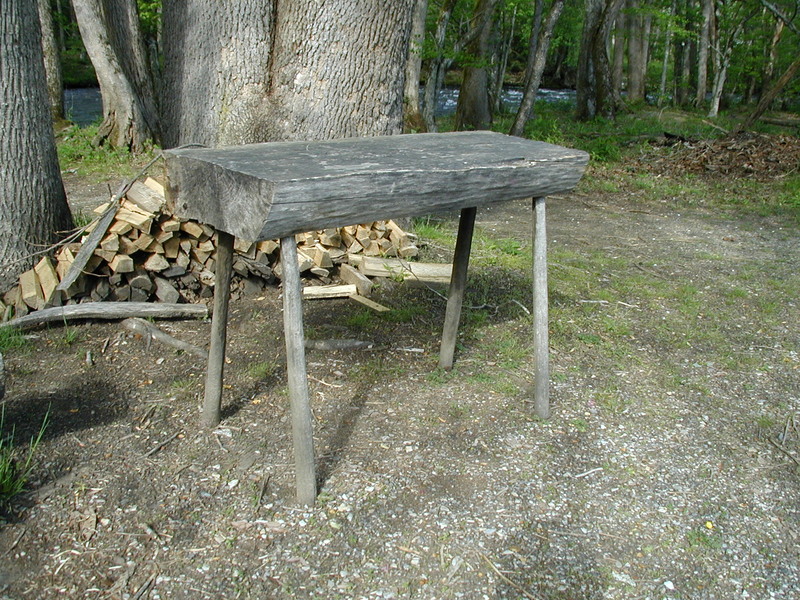 A table constructed of a wood plank with smaller tree limbs used for legs. Practical and cheap back then, a wood slab that size today would cost a small fortune! 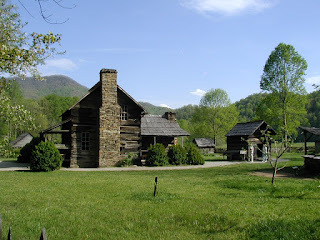 Continue to Next Page: Free Stock Photos of Cades Cove. 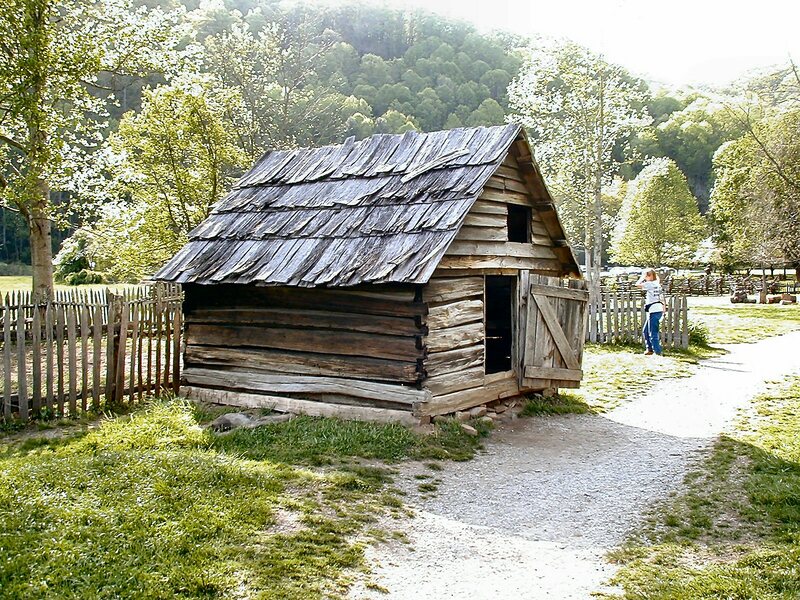 The extremely popular Cades Cove in the Tennessee portion of Great Smoky Mountains National Park has a collection of historic cabins, homes, and a grist mill, all in a beautiful valley. Check it out!